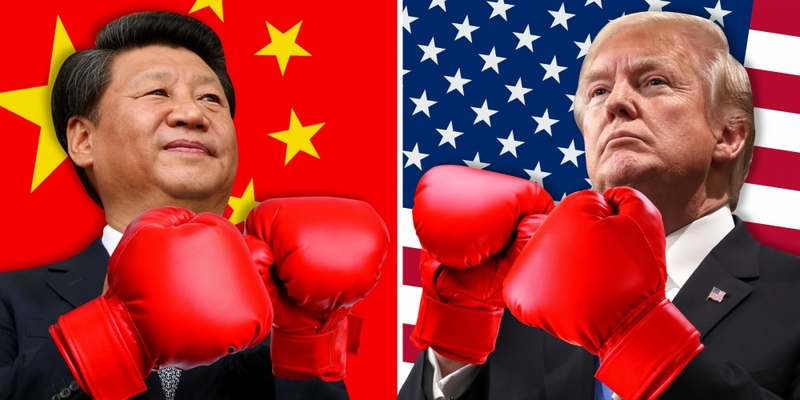 As trade tensions between the United States and China escalate, short-term but widespread disruption can be expected in Asia — but other regional players may stand to benefit in the long run, said Nick Marro from The Economist Intelligence Unit. 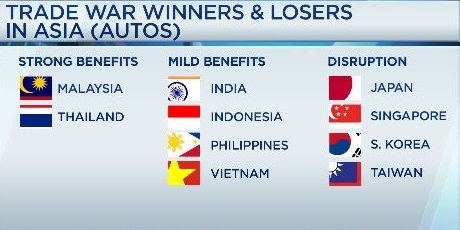 Supply chains in Asia are so "incredibly integrated," Marro, an analyst at the research firm told CNBC on Thursday. "As a result of the trade war, in the short term, we are expecting pretty widespread regional disruption." Marro identified three major industries he considered "battlegrounds" for the trade war: technology, autos and agriculture. 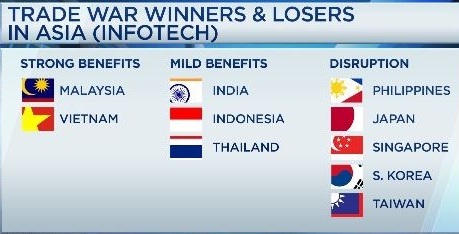 Countries such as Vietnam, Malaysia, and Thailand could see long-term benefits in some of their sectors including information and communications technology (ICT), as well as autos, Marro said. Vietnam and Malaysia could benefit the most from the trade escalation particularly in low-end manufacturing of technology products such as "intermediate components and manufacturing of consumer goods like mobile phones and laptops," according to a report by the EIU. Major electronic companies have existing operations in the two countries, which would make redeployment of investment and production relatively smoother, the report stated. U.S. tariffs on Chinese auto parts will bring adjustments in supply chains and investments benefiting some regional players such as Thailand and Malaysia. "The U.S. is the world's largest auto parts consumer and it has already put tariffs on auto parts that will inevitably squeeze Chinese manufacturers," Marro explained. This will result in "investment re-diversification, supply chain adjustments into some of China's neighbors," he said. Thailand's auto space stands to benefit due to its well-diversified trade links with the U.S., Japan and other parts of ASEAN. As such, local parts producers should be able to win market share from Chinese competitors, according to the EIU report. Malaysia has over 800 auto component manufacturers and a diversified auto component export network, which would be a huge advantage for the sector, the EIU report said. Mitsubitshi MRJ Plane to Secure First Southeast Asian Customer?